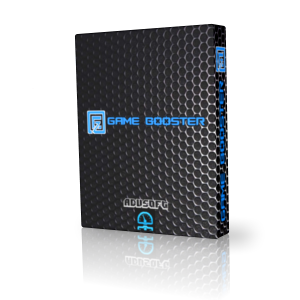 EZ Game Booster 1.6.3 was available as a giveaway on October 1, 2018! 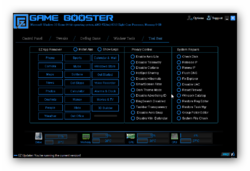 How would you improve EZ Game Booster 1.6.3? 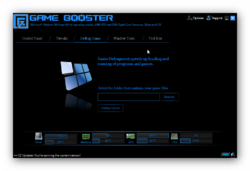 My question is whether EZ Game Booster 1.6.3 will “optimize” my computer for things like streaming stock market charts and data (and improve the speed of placing orders), heavy Photoshop use, and streaming video – or whether it will block some of the things I need for those applications instead. In Sept. 2015, I had a $4,000 (not including keyboard, mouse or monitor) computer custom built (Asus X99 Deluxe II motherboard, Intel Core i7-6900K LGA2011 CPU @3.20 gHz, two MSI Geforce 970 graphics/video processors, 1tb SSD for Windows and applications, 32gb of RAM (which I found later is not compatible with overclocking), Windows 7 Pro X64, Corsair liquid cooling system for the CPU, etc. This computer has been a disaster. The computer was supposed to boot up in 4-7 seconds. BootRacer shows the average startup time (excluding any time awaiting password entry) for the past week as 227.850 seconds. This is typical. The number of Windows crashes was in the 20s when I lost count; 6 of them were unrecoverable, and the computer had to be returned for repairs. A 750-watt power supply was used, when a 1000-watt supply was required, and the liquid cooler was attached to the CPU_FAN register, both of which caused additional crashes and additional returns of the machine. I’m not a gamer. 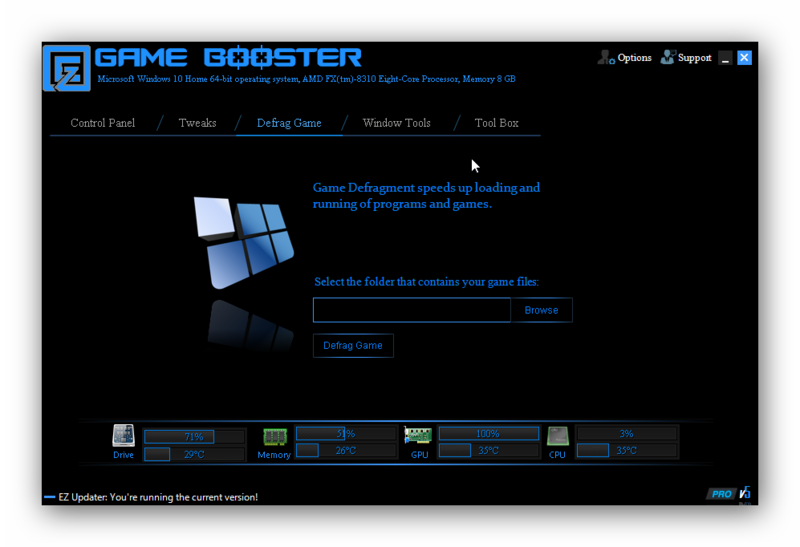 My question is whether EZ Game Booster 1.6.3 will “optimize” my computer for things like streaming stock market charts and data (and improve the speed of placing orders), heavy Photoshop use, and streaming video – or whether it will block some of the things I need for those applications instead. In Sept. 2015, I had a $4,000 (not including keyboard, mouse or monitor) computer custom built (Asus X99 Deluxe II motherboard, Intel Core i7-6900K LGA2011 CPU @3.20 gHz, two MSI Geforce 970 graphics/video processors, 1tb SSD for Windows and applications, 32gb of RAM (which I found later is not compatible with overclocking), Windows 7 Pro X64, Corsair liquid cooling system for the CPU, etc. This computer has been a disaster. The computer was supposed to boot up in 4-7 seconds. BootRacer shows the average startup time (excluding any time awaiting password entry) for the past week as 227.850 seconds. This is typical. The number of Windows crashes was in the 20s when I lost count; 6 of them were unrecoverable, and the computer had to be returned for repairs. A 750-watt power supply was used, when a 1000-watt supply was required, and the liquid cooler was attached to the CPU_FAN register, both of which caused additional crashes and additional returns of the machine. Dave, I'm really sorry to hear that when my $1000 rig has been perfectly stable for years. No BSOD, fast boot time, etc. I believe your issue somehow because of faulty/incompatible hardware. No amount of PC maintenance software can fix that when the OS is not an issue especially if it's "Win 7" which often devoted as "most stable OS today". $4,000 buys a FARM of new and used computers, which altogether would give you -w-a-y- more resources than depending on one and only one ( do you make coffee while you reboot or await repair, or do you want to use another computer and keep busy, hmm ? ). You could even throw in a couple of Macs and Linux computers, and ... Novell Netware ( way faster than Microsoft anything even as a single console user of the network server ). EZ Game Booster offers ( 1 ) a console for selecting INDIVIDUAL tweaks, AND ( 2 ) can monitor and keep Windows as responsive as possible. There are a gazillion other free and for-fee tweaking programs. There are dozens of other free and for-fee responsiveness-maintaining programs. The "Game" in the name is to claim association with supposedly the fastest, most demanding computer users. But you are right, the responsiveness of Photoshop and stock-trading are also important, as well as printing and other tasks that we'd all like to be as responsive as possible. Hence a $4,000 NETWORK of less-expensive purpose-built computers, all of which offer some redundancy for each other. Remember when you could buy a stereo hi-fi all-in-one ... and when the tape-deck jammed, you lost the use of everything else while it was being fixed? Eggs in one basket much? Don't go back there folks, put Photoshop on one computer, stock-trading on another, set one as a print server, and so on. I even have an old Windows 98 laptop to run my Quicken for DOS, which never needs to be on the Internet or do other tasks, it's just my accounting ... and can be replaced by another $25 used laptop on demand ( Quicken AND my data backup to ONE floppy or thumb-drive, and is portable to work anywhere ).
. [ Dave ], We're -w-a-y- off topic here, but ... $4,000 buys a FARM of new and used computers, which altogether would give you -w-a-y- more resources than depending on one and only one ( do you make coffee while you reboot or await repair, or do you want to use another computer and keep busy, hmm ? ). You could even throw in a couple of Macs and Linux computers, and ... Novell Netware ( way faster than Microsoft anything even as a single console user of the network server ). 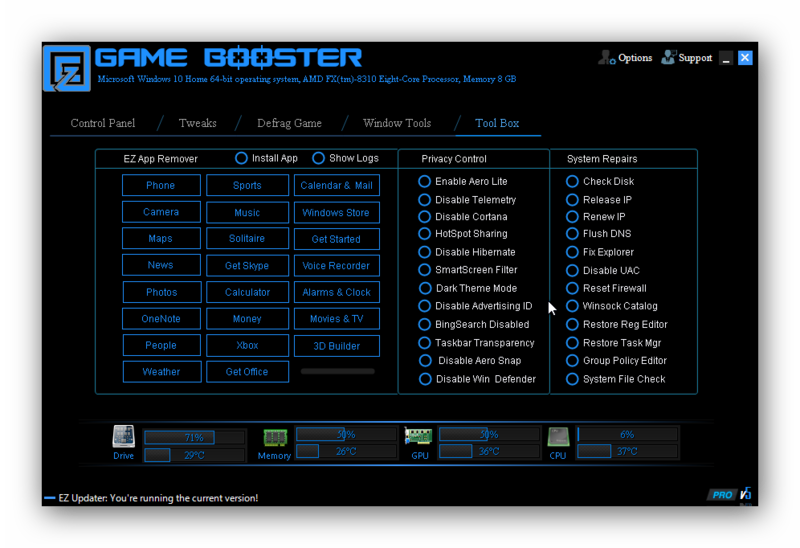 __________ EZ Game Booster offers ( 1 ) a console for selecting INDIVIDUAL tweaks, AND ( 2 ) can monitor and keep Windows as responsive as possible. There are a gazillion other free and for-fee tweaking programs. There are dozens of other free and for-fee responsiveness-maintaining programs. The "Game" in the name is to claim association with supposedly the fastest, most demanding computer users. But you are right, the responsiveness of Photoshop and stock-trading are also important, as well as printing and other tasks that we'd all like to be as responsive as possible. Hence a $4,000 NETWORK of less-expensive purpose-built computers, all of which offer some redundancy for each other. Remember when you could buy a stereo hi-fi all-in-one ... and when the tape-deck jammed, you lost the use of everything else while it was being fixed? Eggs in one basket much? Don't go back there folks, put Photoshop on one computer, stock-trading on another, set one as a print server, and so on. I even have an old Windows 98 laptop to run my Quicken for DOS, which never needs to be on the Internet or do other tasks, it's just my accounting ... and can be replaced by another $25 used laptop on demand ( Quicken AND my data backup to ONE floppy or thumb-drive, and is portable to work anywhere ). Divide or be conquered. .
Peter Blaise, your advice does makes sense. I disregarded the fact that OP is trying to run multiple heavy task on one system in my comment above.. 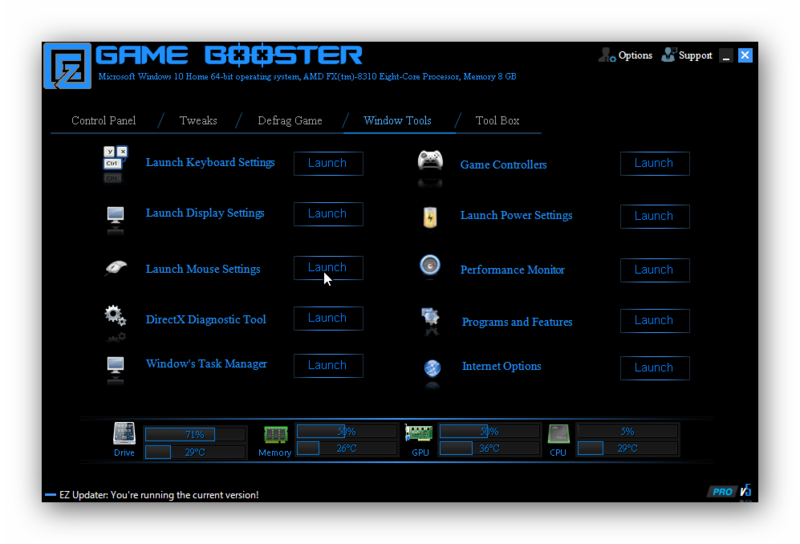 If you are truly investing in PC gaming you won't ever need these 'booster' at all. It offers nothing that you cannot steadily do by yourself. VTC, exactly this. It offers nothing that you cannot steadily do by yourself. After reading your post, I installed the program in WinXP-Virt. Also that one did not work. Dadams After reading your post, I installed the program in WinXP-Virt. The installation went without any trouble/warning, but the program did not start, as you mentioned: https://www.dropbox.com/s/x3ygzsj3ijw49b7/SetupWinXP.png There is also a program from Sysinternal in the programmap, strange: https://www.dropbox.com/s/pyq764rjvej3mnj/Config.png In WinXP I contacted the internet and downloaded the trial: https://www.dropbox.com/s/e6ena3mt4li9lm2/DownloadXP.png Also that one did not work. Does not work, tried installing twice and still nothing. The program would install alright, but once opened none of the program controls would work. Ended up uninstalling it, too bad it looked like it would be a helpful program to have. Same for me on one PC. but worked on another and seems fine there -- quirky, but it seems to auto-force system responsiveness unlike Winutils Memory Optimizer, Boost by Reason, AND Process Lasso. Folks, reboot and keep trying to get it to work, because when it does, it's a keeper for me.
. [ Bruce Giles ], Same for me on one PC. but worked on another and seems fine there -- quirky, but it seems to auto-force system responsiveness unlike Winutils Memory Optimizer, Boost by Reason, AND Process Lasso. Folks, reboot and keep trying to get it to work, because when it does, it's a keeper for me. .
http://www.bluesprig.com/jetboost.html Free and does more. Though both may be clean-up-after-able, when will programmers test at VirusTotal before releasing the programs?
. [ Mothman ], Cool. BlueSprig Jet Boost v2.0.0.67 has there VirusTotal results: DrWeb	Program.Unwanted.770	20180930 Rising	Malware.Undefined!8.C (CLOUD)	20181001 SentinelOne (Static ML)	static engine - malicious	20180926 Versus EZ Game Booster v1.6.3 and it's VirusTotal results: Bkav	W32.eHeur.Malware09	20181001 Though both may be clean-up-after-able, when will programmers test at VirusTotal before releasing the programs? . Mothman, Jetboost is complete trash. Malwarebyte uninstalls it every time Install it. Process Lasso, though a terrific stability enhancer, even in the free-with-boot-nag version, has no tweaks or controls for Windows. 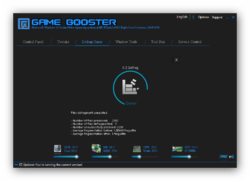 EZ game Booster immediately offered tweaks for network, speed, and stability.
. [ Larry watkins ], Process Lasso, though a terrific stability enhancer, even in the free-with-boot-nag version, has no tweaks or controls for Windows. 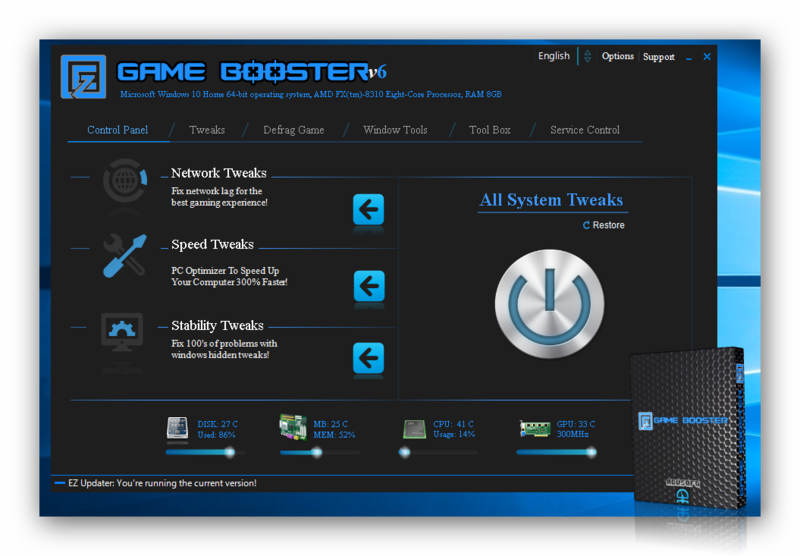 EZ game Booster immediately offered tweaks for network, speed, and stability. .
Razor did absolutely nothing but consume 300+ MB of download noise and space and on-screen gibberish with no controls or settings or savvy about my computer's performance potential, and offered nothing of what you claim.
. [ Robert G. ], Razor did absolutely nothing but consume 300+ MB of download noise and space and on-screen gibberish with no controls or settings or savvy about my computer's performance potential, and offered nothing of what you claim. 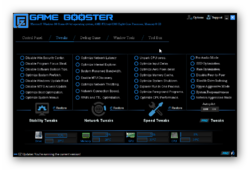 EZ game Booster immediately offered tweaks for network, speed, and stability. ...just saying. .
dadams, the error message will include information that it's a 64-bit executable if that is the problem. If the error is simply that it is not a valid win32 application that means it was built with incompatible operating system version requirements e.g. built for NT6.0 and above (Vista and above) and trying to execute such executables under NT5.1 (XP). I would test this out to confirm the system requirements are incorrect but I do not want the hassle of repairing a windows installation due to some developer disabling a bunch of services without knowing the true reprocussions of what they have done. dadams, I have installed it on a virtual W8.1 64 Pro. It installed in the 32 bit Program folder. I have exported it to a 32 bit virtual ThinPC (a stripped W7 32). It runs fine there. So it is not a 64 bitter. Next, I installed it fully on a virtual ThinPC. I have to run it as adminstrator. But it runs fine. It really is a 32 bitter. dadams, I have installed it on a virtual W8.1 64 Pro. It installed in the 32 bit Program folder. I have exported it to a 32 bit virtual ThinPC (a stripped W7 32). It runs fine there. So it is not a 64 bitter. Next, I installed it fully on a virtual ThinPC. I have to run it as adminstrator. But it runs fine. It really is a 32 bitter. Thank you guys for the info. This gives me some hope. The goal for me to install this is to get my DOOM running as I get the same type of error when I try to play it. I am hoping this offer can make DOOM play. I tried a dosbox but became frustrated because I could not understand how to set it up. I will keep trying. krypteller, Thank you guys for the info. This gives me some hope. The goal for me to install this is to get my DOOM running as I get the same type of error when I try to play it. I am hoping this offer can make DOOM play. I tried a dosbox but became frustrated because I could not understand how to set it up. I will keep trying. Peter Blaise, you realise none of those offers anything you cannot do yourself? Peter Blaise, Try re-installing it. I can defrag games, get Z Silver, special offers, etc. Peter Blaise, Try re-installing it. I can defrag games, get Z Silver, special offers, etc. Of course many tweak programs are tools that anyone with a cursory lack of fear of RegEdit can do themselves, but we're discussing supposedly more-sophisticated tools ... yet when a promise of a screwdriver can't even function as a hammer, we share our experiences to help others feel confident that they are not alone in their frustration. But, no, there is no manual registry tweak that automatically keeps Windows responsive regardless of load, hence the search for automatic screwdrivers, so to speak.
. [ Dark Raven ], Of course many tweak programs are tools that anyone with a cursory lack of fear of RegEdit can do themselves, but we're discussing supposedly more-sophisticated tools ... yet when a promise of a screwdriver can't even function as a hammer, we share our experiences to help others feel confident that they are not alone in their frustration. But, no, there is no manual registry tweak that automatically keeps Windows responsive regardless of load, hence the search for automatic screwdrivers, so to speak. .
Do you mean "... try reinstalling [ Razer ] ..." ? Razer offered nothing on screen for all it's massiveness and inability. 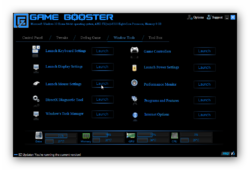 I already suggested that folks try rebooting and or reinstalling EX Game Booster because at least EZ Game Booster offered tweaks on screen ( whether they worked or not ).
. [ Robert G. ], Do you mean "... try reinstalling [ Razer ] ..." ? Why? Razer offered nothing on screen for all it's massiveness and inability. 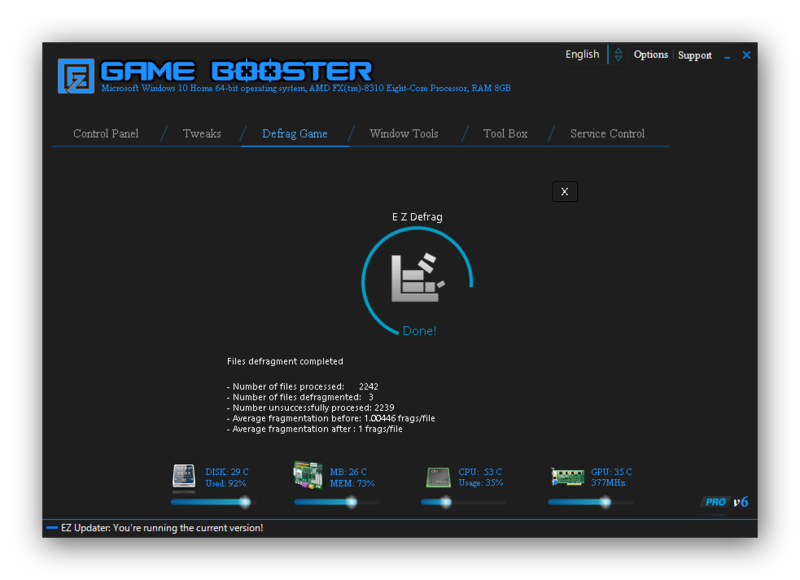 I already suggested that folks try rebooting and or reinstalling EX Game Booster because at least EZ Game Booster offered tweaks on screen ( whether they worked or not ). .